‘Tis the season for tricks and treats, which leads to Clay Street Press presenting Frank Herrmann: Monotypes and Other Works. The tricks are the manipulations that Herrman and printer Mark Patsfall invented as they “played” with the monoprint medium. The treats are the results available to our wondering eyes. Patsfall suggested last summer that Herrmann put out a series at Clay Street. Herrmann, who never stops sketching and thinking art, took the opportunity, using as his theme a “primordial pond” abstractly depicting the idea of life’s beginning. The display starts with a set of ten watercolors, where the pond and its soft currents are home to an elongated egg image. The egg shape, whether intimating perspective or simply suspended in the pond, is a laser-cut stencil, and the shape is the basis of the large scale prints and paintings around the gallery. The pond’s currents are delicate, curled shapes, sometimes imprinted in complex backgrounds or as more subjective shapes on the surface of the prints. These shapes, too, are stencils cut of wood, aluminum, plastic, and more. Monoprints lend themselves to endless ways of layering, actually as much fun as art can be. Various methods of placing the stencils allow the shapes to move back and forward, depending on the color or the viscosity of the ink, and Herrmann has used this knowledge to hide them in his textured backgrounds, as well as popping out to play the subject Egg shapes are often alive with incipient seeds, the stuff of creation. Through this constant texturing, the print is endowed with the movement of water and all of the tiny living possibilities. Moving on through the gallery, it becomes more difficult to find the eggs, but the ambiance of creation continues to dominate, on rich, brocaded backgrounds of translucent inks, or stretched into barely identifiable shapes. Quick, painted gestures on the plate begin to appear, complete with brush strokes, a nod to Herrmann’s devotion to painting, as well as an exciting invention. While there are a few shifts in subject matter, most of these pieces contain a sky, a horizon, and a submerged area. Herrmann admits his favorite theme is landscape. Vases squeak in as still-life, and surprising geometric divisions occur in the two large paintings. Quirky explorations, like the undulating cut edges of a few prints catch the eye with a flash of curiosity. Yet it all works, even the two large paintings at either end of the gallery, “Motif Pool-4 (Henry’s Pool)” and “Motif Pools-2”. Both are stronger, heavier, and carry the swirls more obviously, all content which harks back to the print elements. 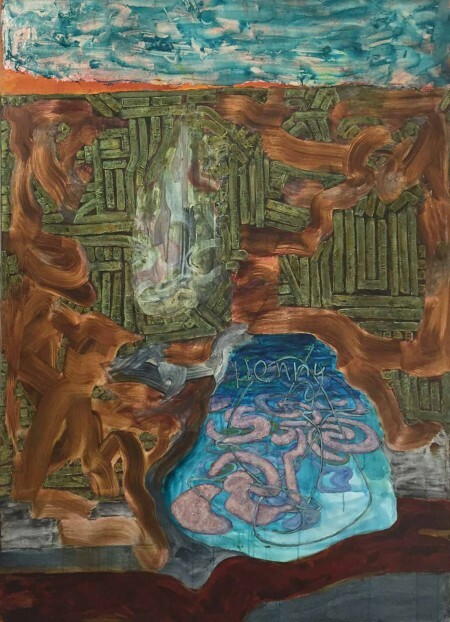 Herrmann, now Professor Emeritus of Art at the University of Cincinnati, taught for 41 years, and has now “graduated to full-time painter”, (his words),a condition fraught with new ambitions. He would like to work away from the ties to the Asmat Series which brought him international acclaim. The intensity of the research and involvement of this pursuit of an isolated Oceanic culture has left him with a ghostly trail of motifs he’d like to either forget or change to move on. As the first step, “Monoprints” is a winner.